At Beauchamp Foot Care we like to do everything we can to help our clients stay as healthy as possible. Taking a closer look at your feet can provide a few more benefits than just making you more comfortable in your shoes. At the clinic we offer regular sessions by fully qualified reflexologist Jeremy Snell who is a member of the Association of Reflexologists. He works with our patients helping them to relax and improve their overall wellbeing. Our feet contain certain points that when manipulated can bring relief to other parts of the body, including areas such as organs, glands and joints. In reflexology a practitioner will massage your feet to clear areas that are blocked and promote the movement of 'chi' or energy. "The ultimate aim is to bring the body to a balanced level of homeostasis so that a person can reach and maintain a true sense of wellbeing." Reflexology has been practised for thousands of years and has its roots in China and India where it is still practised widely today. It is a complementary therapy and is not intended to diagnose or cure medical problems but is meant to promote a sense of calm and relaxation and deeper wellbeing. Qualified reflexologists all have a firm understanding of anatomy and physiology and are aware of how different parts of the body interact with each other. This knowledge helps them to provide targeted massaging of the foot area to benefit the whole body. When you visit Beauchamp Foot Care for your reflexology appointment, you first get a full consultation. This involves Jeremy sitting down with you and taking notes on your medical history as well as a look at your current lifestyle. Once this has been completed, you will be seated comfortably and your footwear, including socks or stockings removed. Your head, knees and feet will be supported with pillows and the session will be carried out in a warm, relaxing environment. The massage takes just under an hour during which time the reflexologist will note any areas that require discussion which he will speak to you about after the session is finished. This could be anything from your posture to tension in certain areas and may be combined with small changes you may need to make in your lifestyle. When the massage has been completed you will be given a glass of water to help flush out any toxins that have been released during the session and given time to relax and discuss things with the therapist. The client usually leaves feeling relaxed and rejuvenated and with some advice on how to maintain their wellbeing in the future. It is usually recommended that you should have between four to six sessions to feel the full benefits of reflexology but even one session can work wonders. In November 2016 Jeremy, our reflexologist, passed the advanced facial reflexology course run by Ziggy Bergman at the London School of Reflexology in Regents Park. Facial reflexology sessions can help the face feel and look smoother and more toned. Over a series of sessions clients will notice a reduction in lines and wrinkles and with this ‘mini face lift’ you can help build up a new layer of skin tissue and improve skin tone. The treatment stimulates the body’s healing mechanisms and encourages it to eliminate toxins. 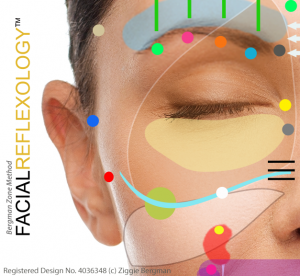 With Facial Reflexology clients can look better, younger, less stressed and have a healthy glow on the outside. Jeremy Snell M.A.R. is a full member of the Association of Reflexologists and registered with the Complementary and Natural Healthcare Council (CNHC). He works at Beauchamp Foot Care on Fridays and Saturdays. To book a session phone 020 7225 0794.